For Sunday Dinner, I mentioned Grandma O’Donnell’s Ovenex bread loaf pan. 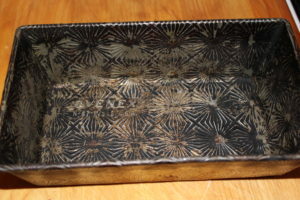 She gave me the loaf pan, and a smaller loaf pan, plus a cookie sheet many years ago. She had them for a long time, how long I don’t know. But long enough to season all of them well! I’ve used these pans for breads, meat loaf, cookies, and as a liner for casseroles that may bubble over. They’re old, they’re used, and they’re heirlooms. I wouldn’t part with them for anything! Grandma O’Donnell’s Ovenex bread loaf pan.